- Granada TV "Know The North"
- Granada TV "Scene at 6:30"
- ABC "Big Night Out"
- "From Me To You"
- "I Saw Her Standing There"
- Associated-Rediffusion "Ready Steady Go"
- ABC "Thank Your Lucky Stars"
- Sveriges Radio - T.V. "Drop In"
- ATV "The Royal Variety Performance"
- "Till There Was You"
- Pathè British News "Beatles Come to Town"
- Granada TV "Late Scene Extra"
- "I Want To Hold Your Hand"
- ATV "Morecambe And Wise Show"
- BBC "It's The Beatles"
- "Roll Over Beethovent", "From Me To You", "I Saw Her Standing There", "This Boy", "All My Loving", "I Wanna Be Your Man", "Please Please Me", "Till There Was You", "She Loves You", "I Want To Hold Your Hand", "Twist And Shout", "Long Tall Sally"
- "I Wanna Be Your Man"
- "I Wan't Be Long"
- "Can't Buy Me Love"
- Rediffusion "Around The Beatles"
- VARA-TV "The Beatles in Nederland"
- GTV 9 "The Beatles sing for Shell"
- Film "A Hard Day's Night"
- "A Hard Day's Night"
- "I Should Have Known Better"
- "I`m Happy Just To Dance With You"
- "Twist And Shout", "You Can't Do That", "All My Loving", "She Loves You", "Things We Said Today", "Roll Over Beethoven", "I Want To Hold Your Hand" (kurz), "Boys", "A Hard Day's Night" , "Long Tall Sally"
- "Kansas City - Hey Hey Hey Hey"
- Granada-TV "Scene At 6:30"
- ABC-TV "Thank Your Lucky Stars"
- "Rock and Roll Music"
- ITV "Ready Steady Go"
- "Kansas City Hey Hey Hey Hey"
- BBC "Top Of The Pops"
- ABC "NME - Poll-Winners Concert"
- franz. TV Channel 2 "Les Beatles En direct Du Palais Des Sports"
- "Twist And Shout", "She´s A Woman", "Ticket To Ride", "Can't Buy Me Love", "I'm A Loser", "I Wanna Be Your Man", "A Hard Day's Night", "Baby's In Black", "Rock And Roll Music" , "Everybody's Trying To Be My Baby", "Long Tall Sally"
- "You´re Going To Lose That Girl"
- "You´ve Got To Hide Your Love Away"
- ABC-TV "Big Night Out"
- ABC-TV "The Beatles at the Shea Stadion"
- "Twist And Shout", "I Feel Fine", "Dizzy Miss Lizzy", "Ticket To Ride", "Can't Buy Me Love", "Baby's In Black", "Act Naturally", "A Hard Day's Night", "Help! ", "I'm Down"
- Granada TV "The Musik Of Lennon And McCartney"
- "We Can Work It out"
- aufgenommen 24.06.66 - Circus Krone, München - ges. 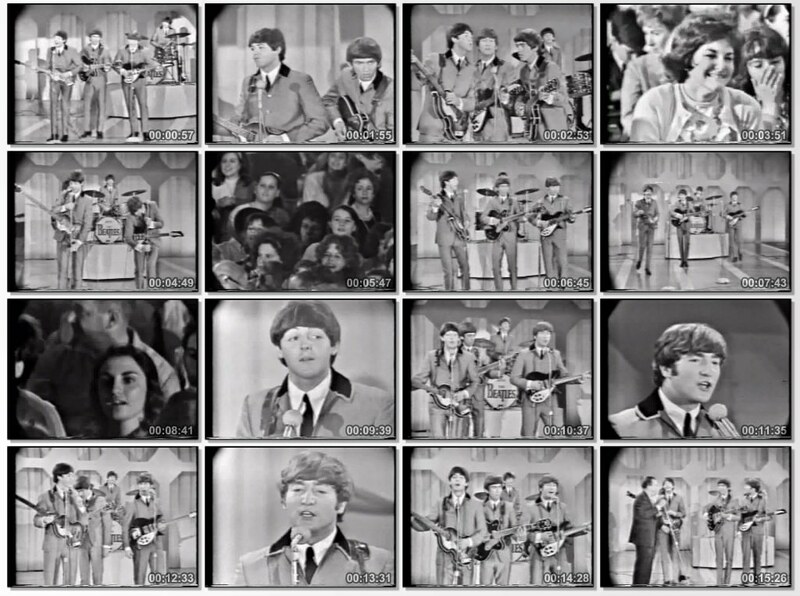 05.07.66 ZDF Special "Die Beatles"
- "Rock And Roll music", "She's A Woman"(kurz angespielt), "Baby's In Black", "I Feel Fine", "Yesterday", "Nowhere Man", "I'm Down"
- "Rock And Roll music", "She's A Woman", "If I Needed Someone", "Day Tripper", "Baby's In Black", "I Feel Fine", "Yesterday", "I Wanna Be Your Man", "Nowhere Man", "Paperback Writer" und "I'm Down"